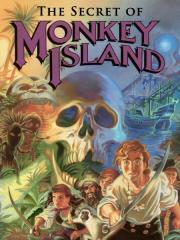 The Secret of Monkey Island is a 1990 point-and-click graphic adventure game developed and published by Lucasfilm Games. It takes place in a fantastic version of the Caribbean during the age of piracy. The player assumes the role of Guybrush Threepwood, a young man who dreams of becoming a pirate and explores fictional islands while solving puzzles (wikipedia.org).